Check our compatibility guide if you want to know whether Acrolinx for Drupal works with your local platforms. You can use Acrolinx for Drupal to include content quality checks into your CMS workflow. This article covers the main steps to get you working comfortably with Acrolinx for Drupal. If you're looking for help to install Acrolinx for Drupal, or to enable fancy configurations like Embed Check Data , take a look at our Acrolinx for Drupal Administrator Guide . Once you've installed the Acrolinx Sidebar in Drupal, navigate to some content, toggle the Manage panel in Drupal, and select Acrolinx from the menu. If you're on a page with editable content fields, you'll see the Acrolinx Sidebar appear. While editing a document in Drupal, Acrolinx for Drupal checks content from all editable fields on the page. This includes any metadata, like captions or alt text for images. Acrolinx checks your content in HTML format. Where can I change the interface language? By default, the Sidebar UI appears in English. If you want the Sidebar to appear in a different language, change your Drupal UI language. You'll need administrator rights to do this - take a look at our Acrolinx for Drupal Administrator Guide . How does Embed Check Data help me keep track of my content quality? Embed Check Data is a feature in Acrolinx for Drupal that lets you view a convenient summary of your content quality. 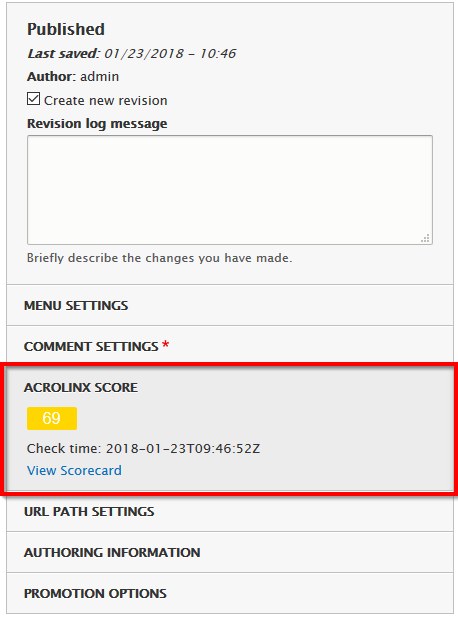 Your Acrolinx Score, time stamp, and link to the Scorecard all get saved and displayed directly in Drupal. Whenever you save your content after running a check with Acrolinx, your check results get saved within the document. This information is visible from the Drupal UI when you edit your content. Once your administrator has enabled Embed Check Data, you'll see an extra field showing your Acrolinx Score, time stamp, and link to the Scorecard while you edit your content.